So I'm getting there. I'm nearly half done with the wedding shawlette. I was hoping to have it finished in the next few days, but I've been called for jury duty. Guess what you can't have at jury duty? That's right - knitting. But apparently I can bring my cell phone and my netbook. So I'm hoping to use the downtime at the courthouse to write up some patterns for tech editing. That and I think I'm actually gonna read some books. Yeah, I know. I never read anymore. It seems like all I do is listen to audiobooks because it's just so much more efficient for me. 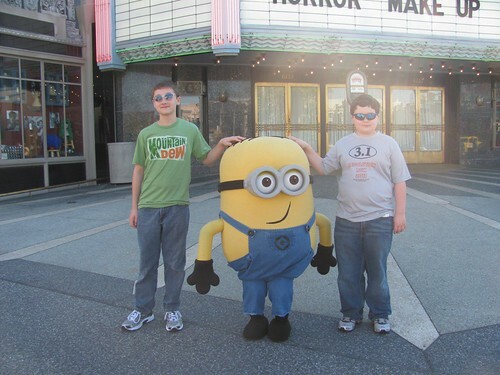 Yesterday we spent an awesome day at Universal. Our season passes are winding down so we want to get a couple of trips in before they expire. It was a beautiful day at the park - 70 degrees, sunny and bright. And granted - my boys are tall - the older is 5'6" and the younger is about 5'1" but how small is the person in this suit? 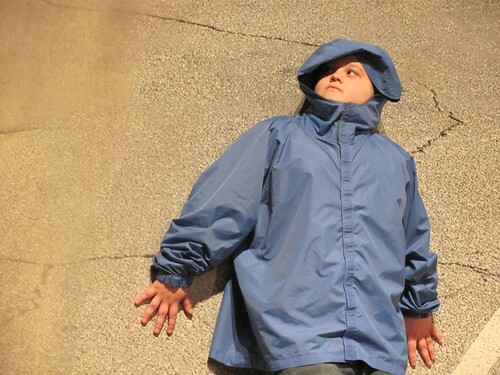 My younger boy made his acting debut in the Disaster Film flick "Mutha Nature". We were lucky to get right up front so he could get chosen! 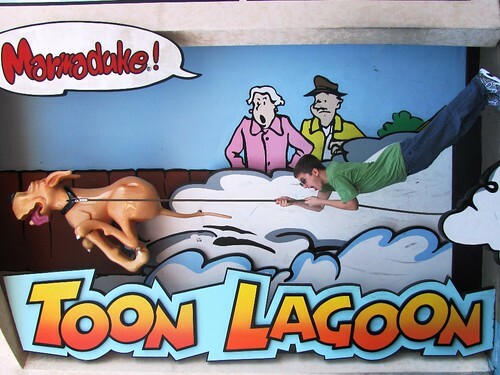 We took some pictures in Toon Lagoon - that's one part of the park I hope they never change. I love seeing all the old comic strips and characters. I rode the Hulk with my older boy and the Flight of the Hippogriff with my youngest. The Beetlejuice show was better than usual - and it's always fun. And we ended the night with dinner at my favorite Orlando restaurant - Uno's. All in all it was a pretty much perfect day.